Editable flyer to use for promoting your holiday shop. Also includes volunteer sign-up tear-off. 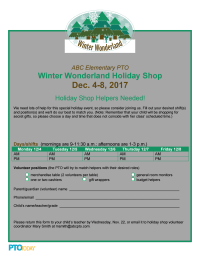 Download along with holiday shop volunteer sign-up sheet, budget envelope label, and sample timeline. 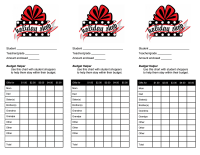 Editable sign-up sheet to use for getting volunteers for your holiday shop. Download along with event flyer, budget envelope label, and sample timeline. Editable timeline to use for planning a Winter Wonderland-theme holiday shop. Download along with Winter Wonderland volunteer sign-up sheet, event flyer, and budget envelope label. Editable “label” to be used to help children budget their holiday shop purchases. 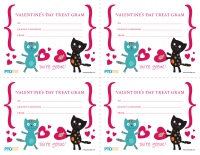 Three labels per sheet; print and affix to envelopes. Download along with Winter Wonderland volunteer sign-up sheet, event flyer, and sample timeline. Editable flyer to use for promoting your Winter Wonderland holiday shop. Also includes volunteer sign-up tear-off. Download along with Winter Wonderland volunteer sign-up sheet, budget envelope label, and sample timeline. 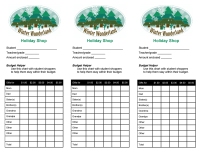 Editable sign-up sheet to use for getting volunteers for your Winter Wonderland holiday shop. Download along with Winter Wonderland event flyer, budget envelope label, and sample timeline. Editable timeline to use for planning a Candy Cane Lane-theme holiday shop. Download along with Candy Cane Lane volunteer sign-up sheet, event flyer, and budget envelope label. 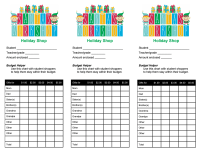 Editable “label” to be used to help children budget their holiday shop purchases. 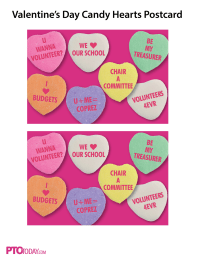 Three labels per sheet; print and affix to envelopes. Download along with Candy Cane Lane volunteer sign-up sheet, event flyer, and sample timeline. Editable flyer to use for promoting your Candy Cane Lane holiday shop. Also includes volunteer sign-up tear-off. Download along with Candy Cane Lane volunteer sign-up sheet, budget envelope label, and sample timeline. 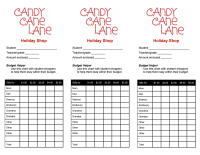 Editable sign-up sheet to use for getting volunteers for your Candy Cane Lane holiday shop. Download along with Candy Cane Lane event flyer, budget envelope label, and sample timeline. 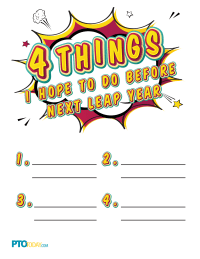 Encourage students to think ahead with this cute sheet that asks them to list four things they hope to do before next Leap Year. It seems crazy to see Feb. 29 on the calendar, so make it a crazy day by including some unusual activities. 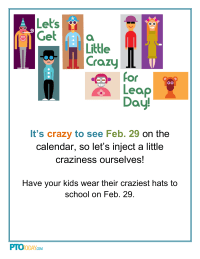 Use this editable flyer to promote a crazy day at your school.